Since tri season finished I’ve been pretty focused on the running. Going out 3 times a week for distances of between 8 and 16K and managing to steadily improve my average speed. I agreed to enter the Marathon back after Kathryn and Ian did Bath but I didn’t initially sign up as I wanted to be sure my ankle could cope with it. My target time was initially 2h15 but then I dropped that to 2h05, 2h, 1h55 and then in the week or so before decided that provided I didn’t blow up in the extra distance 1h50 was achievable. To be honest from training it was suggesting that even 1h45 might be possible but would be a push and require me to maintain 5 minute kilometers for the entire duration of the race. Chris was more confident in my ability to do it than I was but then at the same time I said he should be aiming between 1h50 and 1h55 whereas he was aiming for 2h. We got their nice and early thanks to K getting us a great space nearby and moved ourselves up the field to start with people with similar targets. There were 9000 runners in total all lined up by the City Hall. The race started and I put in my usual couple of quicker KMs which would be needed if I was to stay anywhere near a 5minute average. 6K in and I was a minute and a half up on a 1h45 schedule and for much of the trip along the barrage had the 1h40 pacemaker in sight. I felt strong on the slopes there were, often taking several people as soon as we hit any sort of incline – the advantages of training round here! At around the 8 mile mark I started to feel a pain in my knee which was to get worse as the race went on but being still ahead of schedule I kept going and going and trying to block it out. K was buzzing around town to try to see us as often as she could (and she did it much better than I did in Bath) and that always helped. What didn’t help was being run down by Batman, Robin and a giant Champagne Bottle! Coming into the last kilometre and a bit I knew 1h45 was on but was going to be tight so I digged in and upped the pace reasoning that I could worry about the pain soon enough, as it was as I approached the finishing straight I realised that my Garmin had under measured so when I thought I had another 150m to go I actually didn’t – final time 1h44:09. Must admit to being over the moon with that time as I did think 1h45 was a little optimistic – Chris also came in not far behind pretty much bang on 1h48. I knew he could do 1h50 if he pushed it but to beat that by another 2 minutes is good going – I’ll have to watch myself when he sorts out his chesty-coughy-cold-phlegmy-mystery illness. A great event, course was really good, and my shiny new freebie oakley’s got their racing debut! Do I want to do another – not just yet. It’s taken 3 days for my knee to settle down again – seems it was some sort of inflamed ligament. Not the Darwinian sense this one but a “high-octane urban-based running event with obstacles designed to keep you on your toes” as the organizers put it. Supposed to be 10K but actually more like 14K the race started and finished at the Millenium Centre via the Millenium Stadium but by way of a pile of hay bales, a construction site, some fire hoses, an army assault course, two trips into the Taff, a Parkour section, up and down steps in the stadium, a wind, rain and heat elements challenge and and 8 foot ball to finish! There were other bits too but I can’t remember them all. Chris and I did it as a team and it was great fun, apart from when Chris left me the wrong side of a wall I couldn’t climb and then an 8 minute queue at the penultimate obstacle just due to sheer number of people. I’ll get some pictures up soon. Yes it’s as sore as it looks. Since I last blogged a few things have happened. Kathryn and her mum completely redecorated the living room but alongside that I have removed my fishtank. The fish were all succesfully rehomed – albeit following a stressful weekend of fish capture, tank draining and heavy lifting. The tank itself and everything else has been put into storage until I decide what to do with it. To go with the new room we bought a new sofa using some of our wedding money which arrived about half an hour ago. Now normally I wouldn’t be around to receive it as I’d be in work but at the moment I am one week into an, as yet undetermined, time off work. 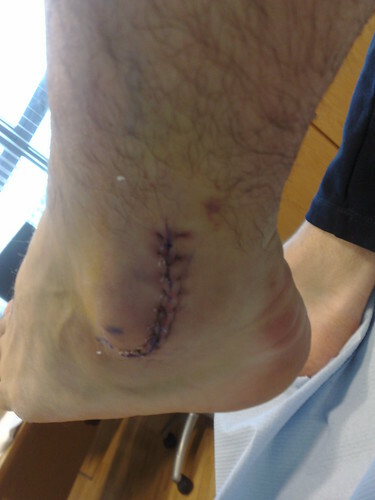 This is because it turns out my troublesome ankle needed reconstructive surgery of the peronial tendons. So I find myself up to my knee in a plaster cast and I’m confined to the sofa. Sounds good you’d think but it’s not the most exciting. I’ve got plenty to do – books, TV, magazines – but I find myself putting them off for a moment when I’m really bored. This moment might be days or weeks down the line but I’m prepared. Not sure its the best way to do it but there you go. One plus point – it’s enabled me to get most of my Christmas shopping done and many other people’s it seems. I seem to have become a present research and procurement service. You all know who you are!! Must mention my beloved wife though – she’s very busy in work and taking care of me each day can’t be anyone’s idea of fun. Having to safely transport me and my various pillows, medicines, crutches and so on to the sofa in the morning and then back to bed in the evening is not an enjoyable activity but she’s doing it anyway. On top of being busy in work and doing lots of other things besides. PS She’s entered in the RNLI Reindeer Run 10K on Sunday so wish her luck. Tomorrow both Kathryn and myself have entered Nike’s Human Race Event. Nike have organised 10K events in 25 different countries around the world where you can run or equally anyone with a Nike+ can enter. We considered going to the London event at Wembley but decided that we’d do it from home instead due to the travel costs involved. At the venues there is live music and all sorts going on so it seems like it would have been good fun. There are 3 charities benefitting from the event namely, Livestrong, UNHCR and WWF. I’d always targetted setting a PB during the event but following my new record of 51.23 the other week and the fact that I’ve had a bad leg since that isn’t going to be possible. That said we’re going to enjoy it and apparently you get a Tshirt if you complete it so Kathryn is plenty happy.